Dalmatian Welfare » Do you need a new home for your Dalmatian? Do you need a new home for your Dalmatian? We British Dalmatian Welfare recognise that family and circumstances in a dog’s lifetime can change. If you need to find a new home for your Dalmatian, please call our Central Co-ordinator on (07905) 495084 to discuss your circumstances and see how we can help. The Central Coordinator will discuss your situation, take some relevant details, ask you to fill in a form and arrange for one of our experienced Dalmatian owners to visit. They will assess your Dalmatian for rehoming, collect more observed information and feed this back to the coordinator so that they can find the right home for your dog. We are not centrally located and we do not have kennels so we ask you to keep your dog until we are able to match your dog to the right home for him or her. 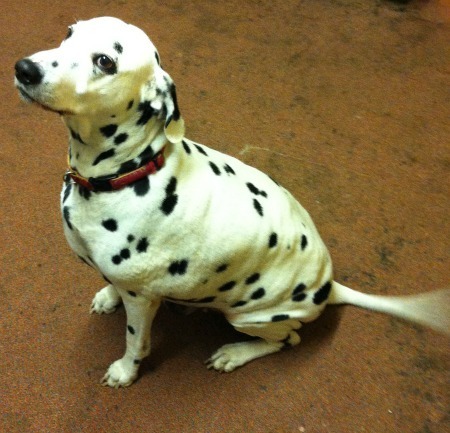 Sometimes we can find a new home for your Dalmatian very quickly; sometimes it can take a little longer. If your dog hasn’t lived with children and is not good with other dogs then these issues amongst others can slow down the adoption process, most of our adopters are families looking for a well behaved friendly Dalmatian. We never guarantee that we can re-home your dog. The time it takes to re-home a dog depends on the dog and the vetted adopter families we have waiting to have a dog from us. It is less stressful for the dog if it is re-homed in one day from its current home to its new home. Your dog will get the best home for him or her based partly on the information you supply to us so we ask that you be as honest as possible. We do not offer your dog to the next family “on the list” we do a very careful matching process to make sure your dog gets the right home for his or her needs. Our re-homing coordinator will call you back and talk you through our process, please note we do not have kennels dogs remain in their homes until we find him or her a new home. Our re-homing coordinator will send you our dog assessment questionnaire either by e-mail or post for you to complete. Once you have completed your part of the form contact our re-homing coordinator and we will arrange for one of our assessors to visit. Depending on your location or availability of assessors this can sometimes take a while to arrange. Once we have the report from our dog assessor our re-homing coordinator will look to match up your dogs needs with our assessed adopters waiting.